God created every person with a desire for meaning and purpose. Many of us wonder, How do we live the purposeful life God intends for each of us? Rob Fuquay's title, Which Way, Lord?, is designed to help us consider that big question. The Damascus road experience was not the only event that sent the apostle Paul on his quest. Throughout Pauls' life his traditions, education, travels, and challenges shaped him for ministry. After years of preparation through prayer and discernment, Paul traveled roughly 10,000 miles throughout the Mediterranean world to spread the Good News. When he started, he had no idea how God's plan for him would take shape. This eCourse helps us unpack our life alongside Paul's life to find our purpose and passion. Our eCourse is one piece of a church-wide series featuring Which Way, Lord? with Rob Fuquay. For more information on the series, visit http://whichwaylord.upperroombooks.com/. If you'd like to experience this eCourse in a private classroom just for your group, let us know by emailing UReLearning@UpperRoom.org. Rev. Rob Fuquay, author of The God We Can Know, is senior pastor at St. Luke’s United Methodist Church in Indianapolis, one of the largest churches in the denomination. A native of Winston-Salem, North Carolina, he has worked in churches since his freshman year in college. 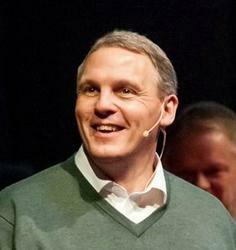 After seminary Rob served a church in Bristol, England, for one year and then pastored several churches, both large and small, in North Carolina. Rob says, “As I study Jesus, I see someone who sought to show grace to all people. I want to be a part of a church that models that [understanding of grace] … a church that cares about reaching beyond its own community and impacting the world with hope.” As part of his work on The God We Can Know, a 7-week churchwide study of the “I Am” sayings of Jesus, Rob traveled to the Holy Land and was filmed in the places where Jesus made several of his “I Am” declarations. We don't want you to be unhappy! If you are unsatisfied with your purchase, contact us in the first 30 days and we will give you a full refund.